I like this one because the circles really stand out and you can really see the fabric. I don’t like the way I would have to plan out a bunch of the fabrics in advance (like Spiky Stars, which worked out well in the end). The other thing that bothers me is the half blocks on the edge. On one hand, they look unfinished. On the other hand they could comprise a self bordering technique border, again like Spiky Stars, that is so effective. In the option above, the blocks would be a lot easier to piece. The crosses really stand out, which is nice, in a way. It looks a lot less interesting than the one above…a lot more regular. So, does this count as another project or a way to get some more sewing done when I am not at the machine? 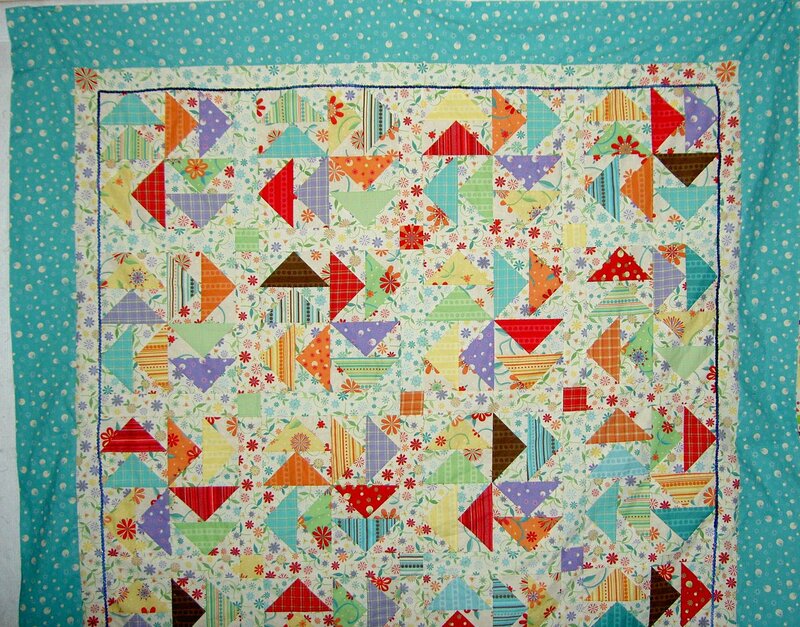 Quiltmaking is a journey and not a destination, so does it matter? 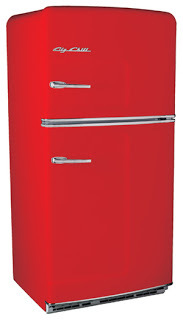 Big Chill Fridge. They come in a number of different colors, much more interesting than stainless. 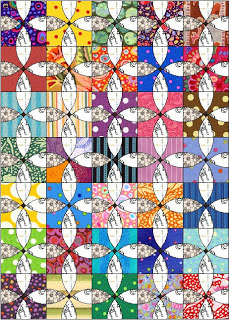 The above are two blocks I made for group quilts. I sent them off today as well as made them! I know it is Friday and I never sew on Friday, but I was hitting the deadline wall and just had to do it and send them. *Blue is always better than red during football season, but we are not talking about football season here. Am I Really Cut Out for Strip Projects?? The Pineapple project requires lots of strips. I am not sure I am cut out for managing such supplies for this project. They are everywhere and I can’t seem to find good combinations of strips. I have seen curtain rods that people have set up on which to hang their strips, but I don’t have anything like that at the moment. Bleah! Still, I soldier on and I seem to be making progress. I finished the strip part of the second two blocks. I still have to put the triangles in the corners, but will do that later. 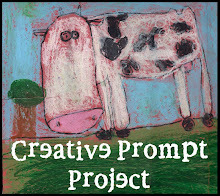 Author JayePosted on Monday, February 19, 2007 Sunday, October 14, 2018 Categories 2007Tags Project-QuiltLeave a comment on Am I Really Cut Out for Strip Projects?? I have made some progress on the Pineapples. I am working on them in between everything else so I don’t feel guilty about starting a new project. Yeah, yeah, I know guilt is not productive. Above is the first bits of the second two blocks. 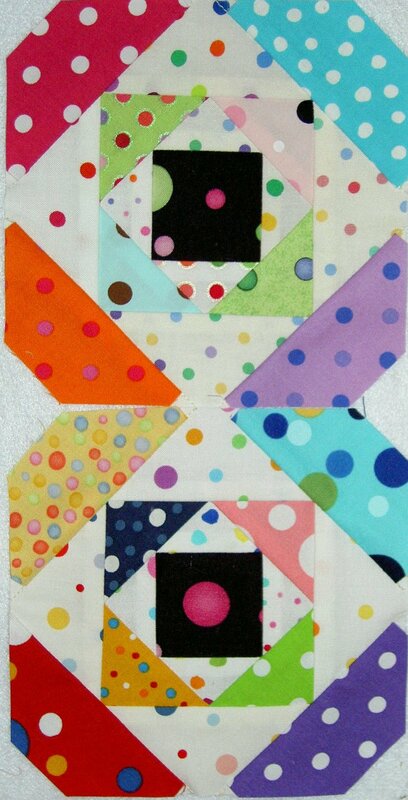 I also added some fabrics with smaller dots. In these photos they look like tone-on-tones. We will see if I use them again. Although rain is forecast for later, the sky is blue and it is very warm outside. Despite all the weird weather we have been having, today things seem back to normal as we always have a week or so of warm weather in the middle of February. I can remember sitting out on our fire escapes as an undergraduate, sunbathing in mid-February with the other girls with whom I lived. 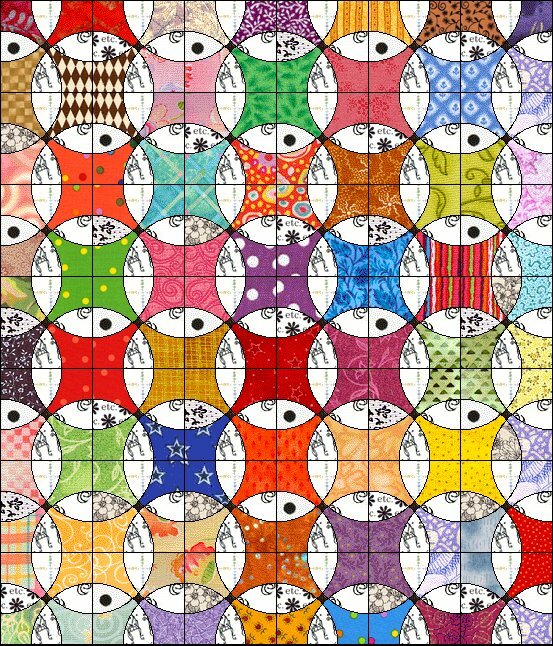 As a result of my renewed good spirits I have finished the back of Serendipity Puzzle. As seems to be my way lately, the thing has turned out to be a monster. Not as monstrous as Thoughts on Dots or the Nosegay, but larger than my design wall, which, in my book, moves it into the monstrous category. It makes it hard to take photos of these quilts! 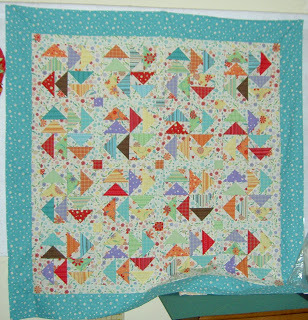 Sometime in the last week or, perhaps, last weekend I put rickrack on the border of the quilt. As I mentioned, I thought the quilt needed something and this is what I came up with. Deirdre actually suggested rickrack “or something.” I had some rickrack, but not enough to go around all the way. I used two different colors rather than buying more. I think it looks fine. 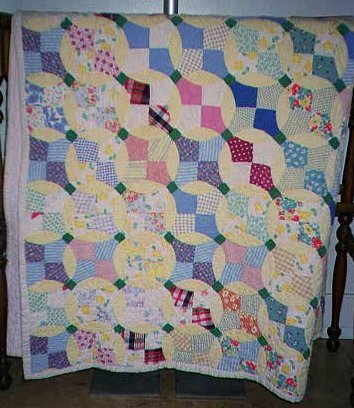 The only irritation is that I pulled the rickrack a little too tightly as I sewed it on, so the quilt puckers a bit on the border. I thought about unstitching and then decided against it. If the quilter can’t make it ok, then I will unsew it and do it over. Live and learn. Still I am pleased. I feel like I have made progress. Making backs is such a bear! I know now why people buy 108″ backing fabrics. As you know, I have two more to go and was going to have a marathon, but I think I will make a few blocks, work on the Pineapples, perhaps work on the QA challenge and rest a bit. I am looking forward to making the back for the Nosegay despite the fact that it, too, is a giant, as I want to get all of those 1930s fabrics into a project, so I can use the bin for dots (or maybe stripes). I know I can easily buy more bins, but my shelves are full of bins, so buying more bins would do me no good since they would just be dumped on the floor with everything else that doesn’t have a home. So, the fog came in, but it didn’t get cold, then it went out again. Now it is cooling off a bit. It doesn’t look like rain clouds, but I would rather have rain than fog. Have a great evening! Author JayePosted on Thursday, February 15, 2007 Sunday, October 14, 2018 Categories 2007Tags Serendipity PuzzleLeave a comment on Borders On! So I am a few days late. It is never too late to think about how to make life better. Luana Rubin writes eloquently about her thoughts for the new year. I can’t help, but working on these little gems intermittently! I will need to add some fuschia. I put the first white/background border and the cornerstones on the piece last night and this morning. Intermittently, I have been working on the back. 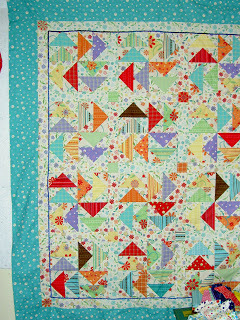 I may have mentioned that I am using some of the leftover fat quarters. I am mostly not using the stripes, because they will be good for the Stars in Stripes quilt that started out as a test that I will probably make into a quilt. It is pretty far down on the list. This is a secondary pattern that I saw after I put the first border on this morning. An article in the New York Times online showed Zaha Hadid’s design for a performing arts center for an island in Abu Dhabi. It reminds me of a Bionicle mask or a car brand’s logo. I love the blue and the swooping sort of shape. I also like that a woman designed it. What inspiration! Author JayePosted on Saturday, February 3, 2007 Sunday, October 14, 2018 Categories 2007Tags InspirationLeave a comment on Be Inspired! This was my original idea. After I put it up on the wall I wasn’t sure. I then thought about just putting a smallish border on with the white background fabric. The size would be the same as the sashing size (1.75″ finished). This morning I looked at the blue and white borders again and added the cornerstone (fussy cut to display a flower motif) and decided that I like the combined look. There is something about the blue that finishes the quilt. 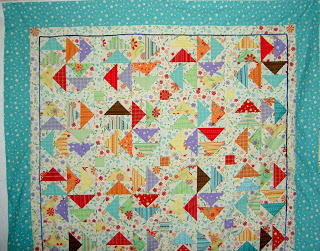 I also noticed that the blue makes the various blue fabrics in the quilt stand out a bit more. 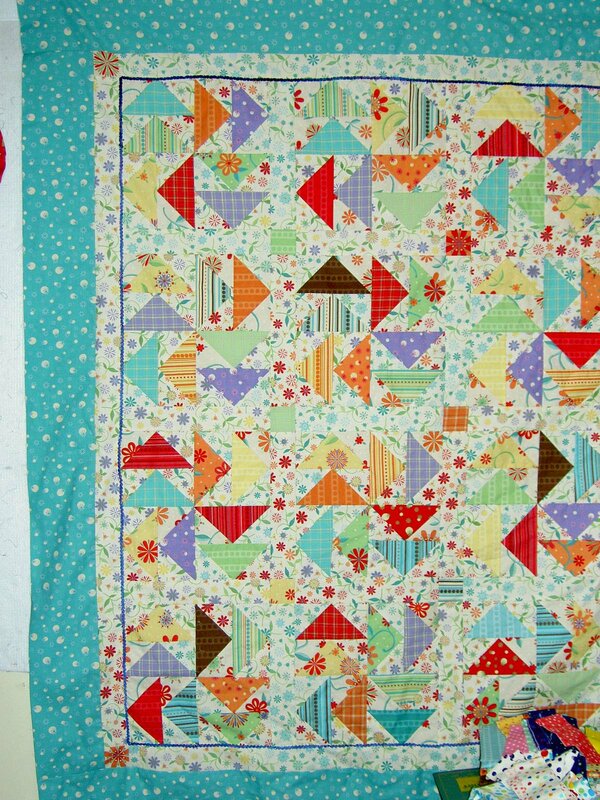 I have to say that I got such a feeling of joy when I was scrutinizing this quilt and looking at the Pineapple Blocks. I think joy is a good thing and will go with the blue and white layout. Author JayePosted on Saturday, February 3, 2007 Sunday, October 14, 2018 Categories 2007Tags Serendipity Puzzle2 Comments on Finalizing Borders? The end of a fountain near Zeum in Yerba Buena Gardens. I love-love-love the spiral. I like the colors in this photo. I don’t usually sew during the week. It is a habit I got out of some years ago due to general evening chores, preparation for the next day, etc. Tonight I just decided to sew 3 more seams and now the top of Serendipity Puzzle is complete. Here is the entire piece. It is very busy and the reds and brown do stick out. It is cheerful. I could just make the back and have it quilted, but will try out some borders before I do that. Detail of one of the blocks. Learning to do something new makes the first two blocks or parts of a project practice. For this project, and, yes, it is now on the project list, I am pretty pleased with these two blocks. 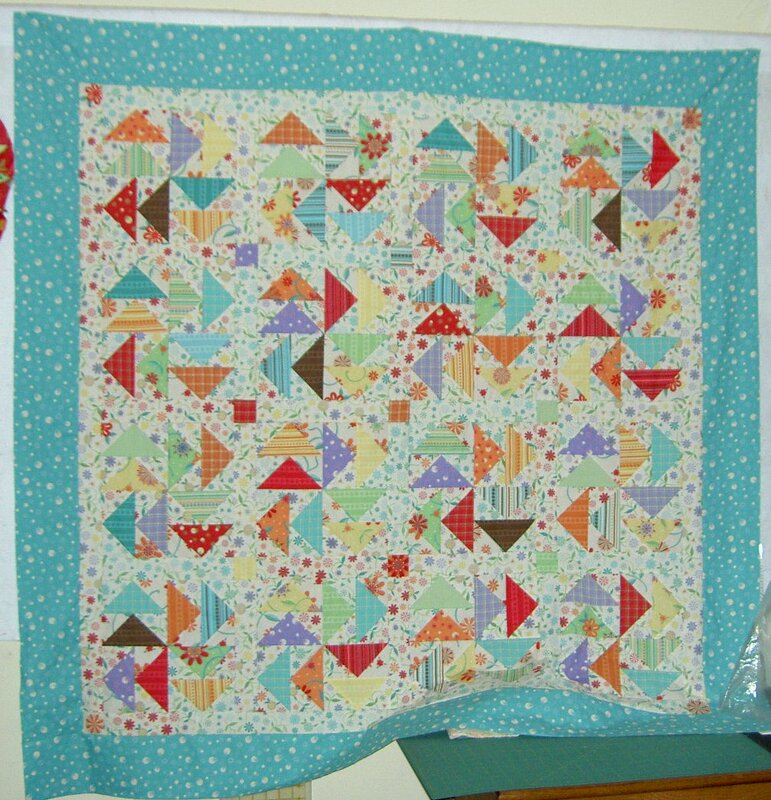 The blocks are fairly flat, there is no paper to rip or muslin to quilt through. I spent some time yesterday putting the last two rows on as well as the corners. I may have to remove the corners and put others on, as they need to be a bit bigger, but we will see. I am very pleased with how the fabrics look together. 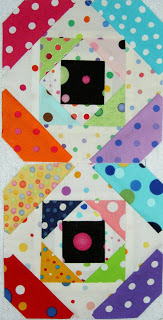 I am still cutting strips, which is a drag, but I will be happy when I have piece of all of my dots cut. Here is my last try at figuring out which fabrics to use for the sashing. 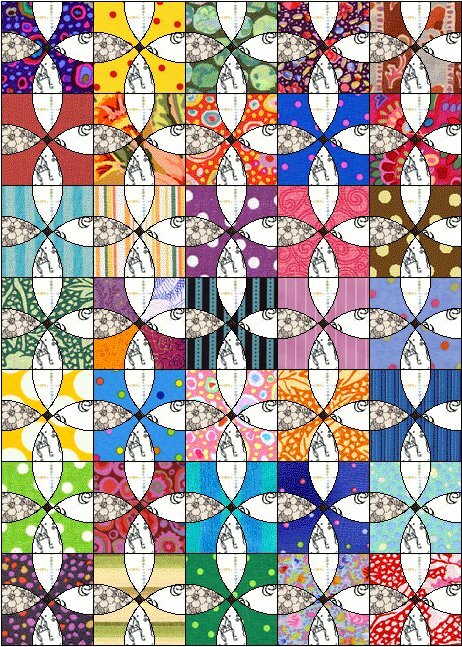 I decided against the larger print background fabric. 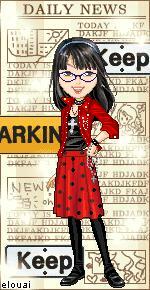 The background of that particular fabrics is not as bright as the background on the others. Also, the motifs are so big that they mostly got cut off. 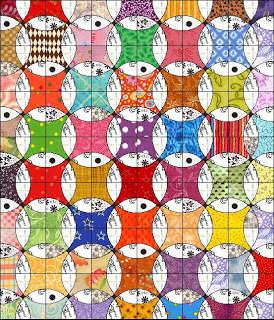 Once again, I am trying to sew it together in chunks (rather than rows) to keep the piece straighter and more manageable. Essentially, I have two more seams to sew to get this baby done. I can’t avoid them being long seams. Of course, there is the border. I, also, already started the back.